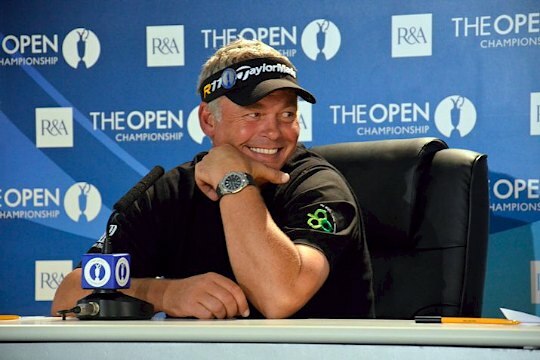 Darren Clarke confirmed he will return to the PGA Tour for a first time in seven years and since the passing of his first wife. The Northern Irishman is taking advantage of a five-year PGA Tour exemption he earned in capturing the 2011 British Open Championship. And if the 45-year old, who also hasn’t won since his Royal St. Georges triumph, does not qualify for the European Tour’s end-of-year ‘Final Series’ he is likely then to head back to the PGA Tour for the November 7th commencing McGladrey Championship at Sea Island, Georgia. The event is the fifth in a new revamped 2014 schedule that the PGA Tour unveiled earlier this week and with their new season starting in just three weeks. “I’ve decided I will be taking up my US Tour card next season but that does not mean abandoning Europe,” said Clarke in a statement from management company ISM. Clarke contested his first regular PGA Tour tournament in Hawaii in 1995 but it was not till 2003 he decided to make the move full-time in taking-up full membership. However the growing illness of first wife, Heather saw him play less and less in the States, so much that with her death from cancer in 2006 Clarke forfeited PGA Tour membership to concentrate on competing in Europe so as to be closer to his two sons, Tyrone and Conor. Clarke has since remarried and after discussions involving his management team, the 21-times winning Northern Irishman is taking advantage of the three years remaining on his British Open winning exemption. But unlike close friend, Lee Westwood who sold his palatial England dwelling in Worksop and moved his family to Florida, Clarke instead will travel back-and-forward between the UK and the States. An ISM representative indicated Clarke will try to make the most of the PGA Tour events before Christmas and into the early part of the 2014 New Year ahead of concentrating on the European Tour around the time of the flagship BMW PGA Championship in May. It will mean Clarke is now obliged under PGA and European Tour rules to contest a respective minimum of 15 and 13 events in order to retain membership of each tour. However with the four Majors and four WGCs counting on both tours Clarke needs to play just seven regular PGA Tour events. Among those delighted to see Clarke returning to the PGA Tour is fellow Irishman and British Open champion, Padraig Harrington. “It’s great to see Darren coming back to PGA Tour so with his exemption he can now choose wisely and play the best golf courses on both tours and make it work,” said Harrington.